mermaid (sometimes called sirens): a fabled marine creature with the head and upper body of a human being and the tail of a fish. Similar divine or semidivine beings appear in ancient mythologies. In European folklore, mermaids were natural beings who, like fairies, had magical and prophetic powers. They loved music and often sang. Though very long-lived, they were mortal and had no souls. A red sky warning breaks with the dawn. The sun bleeds bright crimson across the horizon and spills scarlet rays across the waves. From the shore, Ollie watches the rich sunrise dip into the foam fizzling along the shore. Strong bursts of wind throw sand in wild spirals and churn the frothy water. In the distance, far-far along the thin, blurred line of the horizon, a shadow begins to grow. Ollie’s father is a hulking man. He has scars all on his hands and a scraggly sort of beard that looks like something might live inside it. One of his eyes is permanently closed with a thick, raised scar and splotchy pink-and-white marks that never seem to go away. Ollie asks about what happened almost every day, and almost every day his father tells him that he’ll find out when he’s older. But Ollie gets older every day, and he’s yet to learn the truth. He follows his father down the steep slopes of the dunes. He nearly tumbles once, twice, even three times as he scrambles to keep up with his father’s long strides. Ollie wonders if one day he might be as tall as his father; if, maybe, he might wake up one morning and spring to six feet. He hopes he will. He hopes with all the hope he can find in his heart and in his head, because maybe on that day he’d finally hear the stories his father tells him he is too young - too small - to hear. “Be careful,” his father says as they approach the dock. “Watch the waves,” says his father. It’s not much of an explanation, but there is no elaboration, and Ollie doesn’t think he’s supposed to ask for one. When his father stops, Ollie continues on to the end of the dock. 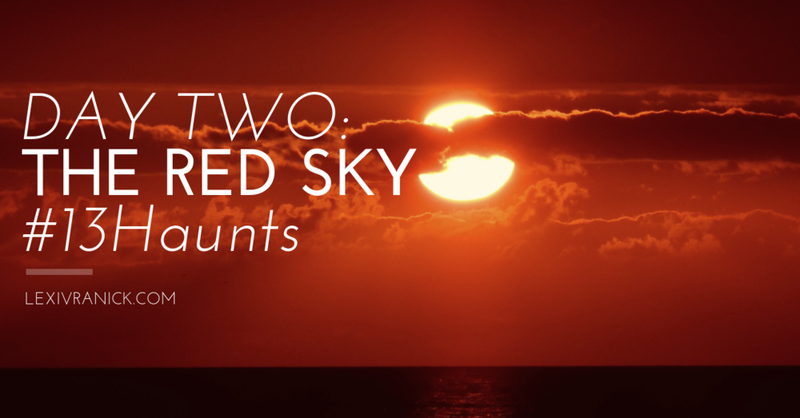 The sky has already begun to turn hazy, the red blurring into something of a deep pink - less scary, less intimidating, but nonetheless otherworldly to young Oliver Kidd. He’s mesmerized, until the memory of his father’s advice jolts him. Ollie turns his attention downward to the water, where the silver scales of frantic fish flicker haphazardly under the spray. “What am I watching for?” Ollie asks. His father stands behind him, his single eye trained on the growing black smudge pulling farther away from the horizon. “You’ll know,” is all his father says. There’s no clarification, so Ollie turns back to the water. The swirl of the foam, the way the waves fold over one another, is hypnotizing. Ollie becomes lost in it. The wind roars and whistles and throws salty seafoam against Ollie’s skin and the water - the water bends and bows and lets the wind drag it to-and-fro, reaches up to light on his hands and catch in his hair. Ollie is lost in it all, so lost he doesn’t notice when the sound of the wind begins to melt into song; soft, and lilting, and in a language foreign to sand and soil. He’s so lost he doesn’t hear the hoarse voice behind him, the sound of his name shouted over and over, the voice growing louder and louder yet always drowned out by the singing that seemed float to the choppy surface of the water. Something reaches out of the water. Slender fingers slip between turbulence. There is a face, Ollie thinks. Angular, but pretty. An older man might call it beautiful. And then there are hands behind him, strong and firm, and a force yanking him backwards. The dock splinters beneath him, and though Ollie feels shaved little slivers of wood stabbing into his hands and his arms but he can’t bring himself to care. The face is still there - the woman, he swears it’s a woman, with dark hair billowing around her slim face and soft eyes. Her lips move under the water but not in the way that s fish’s do, not that mindless open-close-open-close - no. She’s singing. She’s the music in the wind, and Ollie wants to let himself dade into that song, wants to take the woman’s hand and dive into the depths with her - wants to hear her sing forever. When he’s pulled so far he can no longer see her, Ollie screams. He screams, and there is a heavy heat in his face that could burn it clean off. And the world goes black. Ollie’s father is sitting at his bedside. It is dark outside, and the moon spills silver light across the knotted wooden floor. The first thing Ollie notices is that his throat hurts. He wants to talk, but no sound comes out, and it hurts when he tries to force it. He snaps his mouth shut and leans back against the pillows. The second thing Ollie notices is that the pillows are not his own. He blinks, and the candlelit room shifts into focus. The high ceilings. Ropes pulled taught by sailor’s knots tacked onto the walls. A bed as big as a boat - or, at the very least, as big as the dinghies his father keeps at the shore. Ollie is in his father’s bed, in his father’s room. His father is slumped in cracked chair from the kitchen. Ollie suspects he dragged it in, though he’s not sure how long ago he’d parked it in the bedroom. The sheets rustle as Ollie pushes himself upright, leaning against the many pillows his mother had insisted on but that his father usually left on the floor, and he tries to remember what happened. All he can think of is the voice. The voice that rose out of the water, the voice that spun inside his head and made him want to sink deep into the waves and vanish from dry land - forever, for good...he didn’t care. “Pa-” Ollie starts, and then coughs. He tries to tamp it down and hold it all inside his chest, but the stinging in his throat makes a fit explode out of his. The force of it wakes his father. “Easy,” Ollie’s father says. His big hands, calloused and worn, land on Ollie’s shoulders and press him back into the pillows. When Ollie is finished, his father combs back his hair - a gentle gesture that hardly seems to suit his stature or his scars. “Easy,” he says again, and Ollie forgets all the questions he has. Tears prick at his eyes and he flings himself into his father’s chest, his little fingers clawing at his dad’s broad shoulders and clinging there as his father is the only thing keeping him tethered to the earth. When Ollie returns to the water, he is called Oliver. He stands where his father always had, at the far end of the dock where the boats look like specks that grow into hulking beasts. He has not set foot at the edge since That Day. He knows what happened to his father now. That his father has his own That Day. He knows he’s lucky to come away with scars inside his head and not out, thought sometimes he thinks maybe outside would hurt less. That song still stuck inside his skull, plastered there and refusing to peel. He wonders if he’ll ever get it out. Wonders if that woman in the water, the woman who he thinks had fish scales - maybe he had imagined them, and maybe he hadn’t - and who reached out of the waves to take him down to the bottom of the raging surf, down where it might be quiet and he’d be able to hear her song and her song alone. Oliver is older now. He has spent much time away, much time where the ocean can’t crawl up to his feet or try to swallow him whole, and now his skin looks like his father’s had when Oliver was just a boy. But the song has never left him, not in all the years he’d tried to drown it out with whisky and scotch and whatever stinging sludge sloshing at the bottom of dirty bottles. He could never get it out. He still hasn’t, and he’s tried everything but one. So Oliver has come home. He has returned to the dock where it happened, to the water where he’d seen the woman of the waves and heard that damn song for the very first time. It is a red sky morning, just like that day when he was a child and the song stuck to him like a moth to a flame. Oliver waits until the clouds turn hazy magenta, watches as the red bleeds into the water, and then he starts to take slow steps toward the end of the dock. His heart sinks. The song is not there. He doesn’t hear it. It’s only the wind. Until it isn’t only the wind, and the whistling turns to soft hums that float out of the seafoam. Oliver takes a long, slow breath. He clenches his hands into fists, then unclenches them again and rolls his shoulders back. He peeks over the edge.